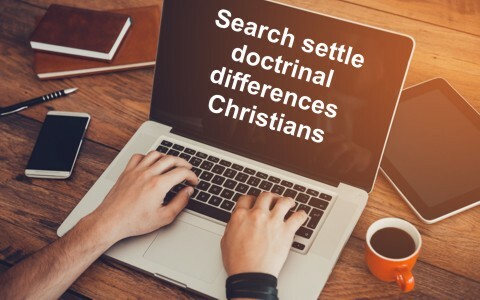 How Should Christians Settle Doctrinal Differences? How should Christians settle their differences over doctrine? There are many teachings in the Bible that we cannot gloss over. The divinity of Jesus, His being born in the flesh, His living a sinless life of perfection, His suffering and dying on the cross, and His being resurrected on the third day. These are things that all Christians must agree on or they are simply wrong and we can’t get these crucial teachings wrong. Our salvation depends on getting doctrine right and understanding Who Jesus is. To believe Jesus is not God is to believe in another Jesus, as some cults do, and if you don’t have the right Jesus, you don’t have the right Savior. These essentials of the faith are not open for debate. They are true no matter what anyone else thinks or says. For the last 2,000 years, people have been trying to make Jesus less than God but if He is not fully God (of course He is), then they are teaching heresy and another gospel altogether. The Apostle Paul warned, “if someone comes and proclaims another Jesus than the one we proclaimed, or if you receive a different spirit from the one you received, or if you accept a different gospel from the one you accepted, you put up with it readily enough” (2nd Cor 11:4). Paul wrote about the “other” gospels, which are really no gospel at all, so he was “… astonished that you are so quickly deserting him who called you in the grace of Christ and are turning to a different gospel” (Gal 1:6). As we have read, any variation of the true gospel of God is not a gospel at all, unless you want to call it, the gospel of Satan because “there are some who trouble you and want to distort the gospel of Christ” (Gal 1:7). Sadly, there are many false teachers who are teaching another gospel and not the one that Jesus brought which concerned repentance and faith (Mark 1:15). Any gospel without the need for repentance is only half a gospel. Today, even in Paul’s day, there are many “false apostles, deceitful workmen, disguising themselves as apostles of Christ” (2nd Cor 11:13), but this shouldn’t surprise us because “even Satan disguises himself as an angel of light” (2nd Cor 11:14), and “So it is no surprise if his servants, also, disguise themselves as servants of righteousness. Their end will correspond to their deeds” (2nd Cor 11:15). To warn the church, Paul often had to educate the church about those who proclaim a gospel that is similar in some ways to the true gospel, “even if we or an angel from heaven should preach to you a gospel contrary to the one we preached to you, let him be accursed” (Gal 1:8). This was of such great importance to Paul that he repeated this warning in several places and wrote again, “As we have said before, so now I say again: If anyone is preaching to you a gospel contrary to the one you received, let him be accursed” (Gal 1:9). Paul wouldn’t have spent so much time writing about this if it wasn’t a serious problem. This “other” gospel is still around today and is masquerading as the real thing, so we must be diligently searching the Scriptures to see if these things are true or not. One church that I attended years ago was so caught up in the dietary laws that they were offended if anyone ate ham or bacon. They also observed the holy days listed in the Old Testament. They condemned smoking, drinking, card playing, dancing, movie watching, and dozens of other “don’t do’s” in their legalistic religion. I had to leave that church. It didn’t feel right to have them condemn others over not following the dietary laws, the holy days, and even grey area issues where the Bible is silent. If the Bible was silent on such things, they weren’t! They thought that some of the Old Testament laws were still in effect and they looked down on others who didn’t believe what they did, but I told one man that I know of a place in town where they don’t drink, don’t smoke, don’t dance, don’t watch movies or play cards; we call it the cemetery. If the Bible is silent on some things, I believe we must be silent too. We shouldn’t speculate on what the Bible is not specific about. If we do, we are adding to what God’s Word teaches, and that’s a serious problem for anyone who does such a thing (Rev 22:18-19). When Christians disagree over main doctrinal issues like the deity of Christ and His sinlessness, you must rebuke them and show them from Scripture why Jesus is both God and Man but is also more than just man. He is God, therefore He cannot sin. Don’t budge on these crucial essentials of the faith, but if things are less than clear in the Bible, in what we might call “grey areas,” we are better off staying completely away from such debates because these always bring contentious spirits and sometimes bitter arguments. No believer should ever engage in arguments over things where the Bible is not totally and specifically clear. We should agree to disagree on non-essentials. It’s okay; we can disagree with others and still not be disagreeable. We have no cause to use the Word of God as a sword in engaging other Christians. The Word of God was never intended for that and the Word of God, as the two-edged sword, is not to be used against other Christians. It is for us and for others to know the truth and be set free and receive eternal life, not to beat each other over the head with it to prove that we’re right and they’re wrong. Tragically, Christians have ruined the witness of Christ by attacking one another over things as silly as the color of the carpet in the church and allowed such petty things as this to divide churches. How this must grieve Jesus Christ Who is the Head of the Church. While it is fine to rebuke or correct another person who is clearly wrong about what the Bible teaches, such as the gospel of repentance and faith, we sin when we start being antagonistic towards others just because they believe in the rapture and others don’t, or we believe in tongues while others focus on taming the tongue. How often have Christians unknowingly destroyed the testimony or witness of the church by fighting among themselves over things that will not matter in eternity? Let us just agree to disagree while not being agreeable. Let us dig our in heels in over things that are essential (Acts 4:12), but never let us wrangle or fight over things that are not-essential and over things that the Bible is not abundantly clear about. To do so is to divide the Body of Christ. Previous post: What Was The Transfiguration About? Next post: Why Did Cain Kill His Brother Abel?